In an increasingly online world, communication on social media is becoming one of the most powerful tools to engage customers with your brand. Did you know that there are more than 2.4 billion social network users worldwide? According to Statista, the average time that internet users spend on social media is 109 minutes per day. This means more than 2 hours of engagement daily: liking, sharing and commenting on posts that bring value to the user. And while there is no doubt that social media is an extremely powerful way to engage with your current clients and reach potential ones, it is really important to do it the right way, aligned with the company’s strategy and goals. Today, we are going to talk about Sprout Social, a social media management software founded in 2010 by Justyn Howard and Aaron Rankin. Sprout Social is a social media management software that helps brands to communicate and engage with their customers on a variety of social media platforms such as Facebook, Twitter, Instagram and LinkedIn. It allows you to publish and tag ongoing content, schedule cross-network campaigns, monitor activity across multiple social networks, and easily interact with customers via an intuitive, easy to navigate dashboard. Moreover, Sprout Social is packed with a powerful analytics tool that measures your social stats, such as clicks, retweets and likes, and helps you identify recurring trends or patterns that are providing useful information for your business. Publish: which allows you to publish content on multiple social media platforms, and schedule it to be published automatically at any given time of the day. Engage: a function that helps you monitor your incoming messages, posts, and mentions in order to find conversation opportunities. Analyze: which gives you insights and allows you to measure your performance to see whether it is in accordance to your KPIs (Key Performance Indicators). Sprout Social has a beautifully designed dashboard that you can navigate easily, optimizing your social media presence and performance. 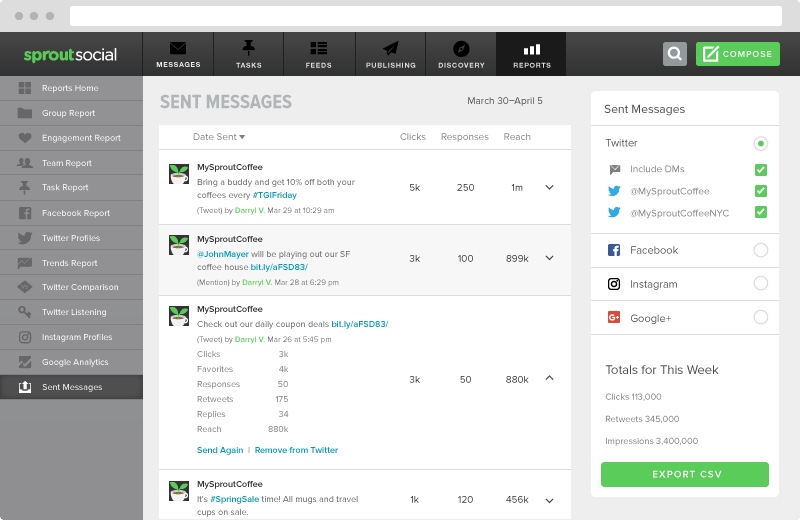 Sprout Social lets you monitor the activity and interaction of your users on all your social feeds at one place, capture all mentions of your brand, manage your tags and keywords, and easily respond to all messages. The tasking feature of the platform allows you to assign messages to team members, view conversation history, solve issues, and create brand advocates. Google Analytics to view website traffic and user acquisition. Some of the reports, such as Twitter Listening and Tag Report, require an upgrade to Corporate Plan, but the majority of them are included with your Basic plan. Sprout Social is cloud-based and you don’t need to download anything in order to start using it. All you need to do is go to their website and register for a 30-day free trial. After the trial has ended, you will be asked to select a paid plan. 3. Can I get a certification in Sprout Social? Does it cost anything? We will be launching marketing, sales and services support for our agency partners. This includes partner badges, co-marketing resources, sales support, partner awards, certifications, the opportunity to learn a listing in our marketplace and more. We will officially launch details on the program over the next couple of months. For more details on the upcoming Agency Partner Program of Social Sprout, consult their website. 5. What features does Sprout Social offer? 6. What are the pros and cons of Sprout Social? Analytics for real-time snapshots and trends. Room for improvement with other integrations. To check the features that come with every plan, click here. 8. What social media integrations does Sprout Social offer? Additionally, Sprout Social offers the possibility for integrations with UserVoice, Bitly, Google Analytics, ZenDesk and Feedly. 9. What else should I know about Social Sprout? Social Sprout offers a mobile app so you can easily manage your social media performance and activity on the go. You need to have an account with Social Sprout in order to be able to use the app. Get the app here for Android and here for iOS. I hope you enjoyed this article, stay tuned for more! Previous Post What is Salesforce and how does it benefit your business?